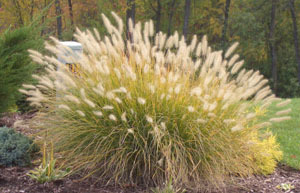 These mostly tufted or clump-forming, ornamental grasses have fuzzy, spike-like flowers that look like narrow bottlebrushes. Drought-resistant, these annuals and perennials prefer dry locations, but grow in most soils. Use stems in flower arrangements. Some types naturalize freely and can become weedy pests. Cut stems before flowers go to seed to control growth. Start most by plant division or seed. In order to prevent crown rot, plant the crown of the plant above ground level.